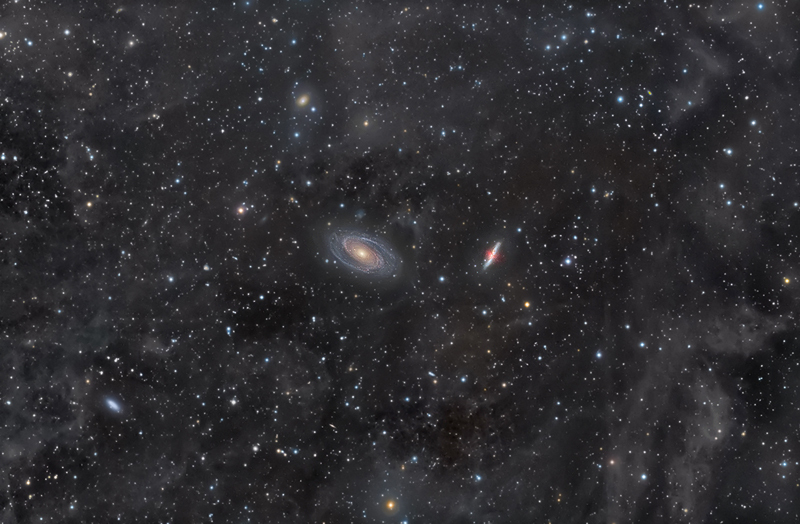 Most images of the M81 and M82 galaxy pair will show the two galaxies (of course), the surrounding stars and a few smaller galaxies here and there. One of the first things I wanted to do once I've got my CCD was to try this field and see if I was able to pull out all that IFN. So I spent three nights capturing data, at three different sites and under three different - but similar - skies. BTW, using several sites is not a requirement to capture IFN, it just so happened that on each of these nights I went to different dark sites. It is my second "serious" image with the FSQ and the STL11k, proving so far that they are a team. Processing this image was extremely challenging but despite I'm not completely satisfied the way the stars ended up, I'm very pleased with the image and in particular the amount of IFN that I was able to pull out.